BISHOP, NATHANIEL, joined the HBC in 1686 and died as master of the company’s Churchill River post on 30 June 1723. Bishop was employed at York Fort from 1686 to 1693 when he sailed for England. He returned to York the following year, and became a prisoner of the French when they captured the post on 4 Oct. 1694. 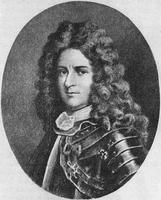 He was back in London early in 1696, rejoined the company, and helped recapture York later that year, only to become Pierre Le Moyne d’Iberville’s prisoner when the French again took the fort in 1697. He arrived back in London in time to sail to Albany on the company’s supply-ship in 1698. After a short stay in England, from 1703 to 1705, Bishop returned to James Bay as deputy to Governor Anthony Beale. The two sailed for England in 1708, and returned to their old positions in James Bay for another three-year spell in 1711. In 1715 Bishop was again at Albany as second to Thomas McCliesh*, who spoke highly of him in letters to the company. During the next five years, Bishop frequently wintered on the East Main; he returned to England in 1720. In 1721 he was appointed master at Churchill River (Fort Prince of Wales), but he could not take over the post until the following year as the supply-ship Hannah was unable to reach Churchill. Meanwhile Richard Staunton* remained in charge of the post. On 5 April 1723 Bishop fell sick of what he believed to be gout and died on 30 June. Richard Norton* and Thomas Bird temporarily assumed “charge” at Churchill, and notified the company’s cornmittee in London of Bishop’s death. HBRS, XXI (Rich); XXV (Davies and Johnson). Kelsey papers (Doughty and Martin). Morton, History of the Canadian west. Richard Glover, “BISHOP, NATHANIEL,” in Dictionary of Canadian Biography, vol. 2, University of Toronto/Université Laval, 2003–, accessed April 20, 2019, http://www.biographi.ca/en/bio/bishop_nathaniel_2E.html.